Yesterday evening I was invited to attend a cookery event by the Consorzio del Proscicutto di Parma. Or in plain English the Parma Ham. Now Parma Ham is a favourite of me and my husband's. 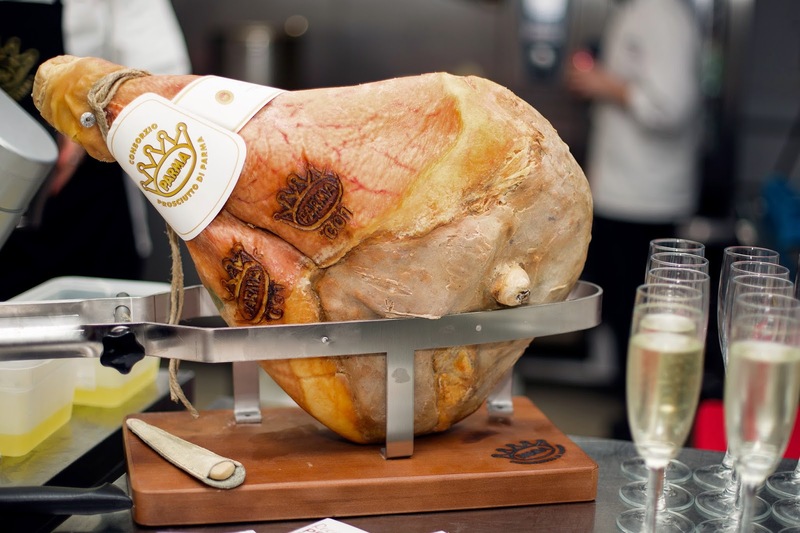 We love this 100% natural ham which is produced in the Parma region of Italy. Whenever we have friends over for drinks, we always serve Parma Ham as part of the antipasti spread. But I have never cooked with it. So I was interested and curious. The venue was the Underground Cookery School. We reached a little late, what with the London tube strike and the crazy traffic on the Old Street roundabout. But just in time to join the team about to learn the secrets of pasta making. 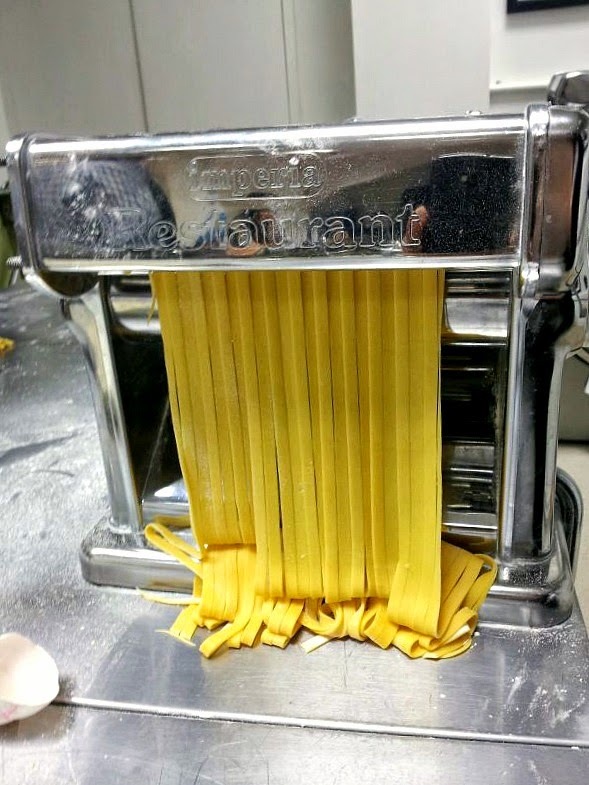 Yes we were taught to make our own pasta. Chef Anthony led the demonstration. First we were given a bowl with flour already measured (quantity to make enough pasta for one person), which we had to mix with an egg and olive oil. Now it was no ordinary egg. It was a free range one with a gorgeous yolk, flown in all the way from Italy. In fact we were told that all the pasta ingredients were Italian--the flour, the eggs, the olive oil. Pretty impressive? I sure was. Impressed I mean. 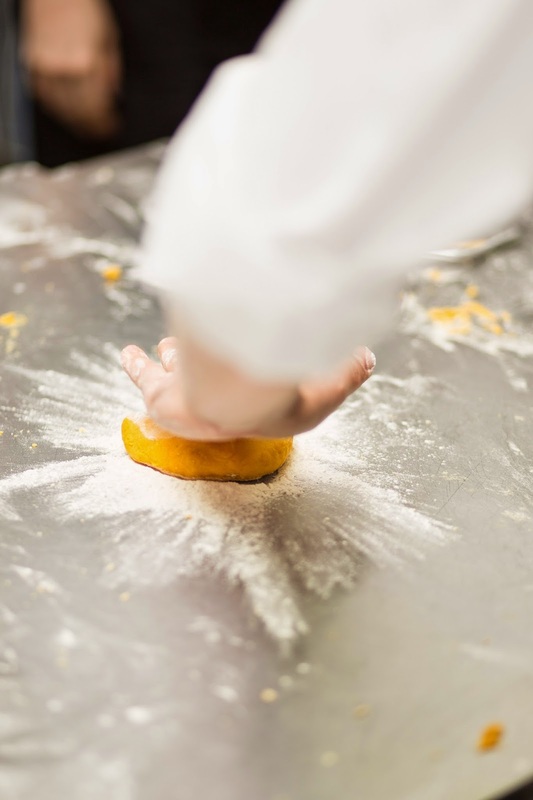 Anyways back to the pasta making, once we had mixed the ingredients, we had to knead the dough with the base of our palms for about 5 minutes.You know pasta making is not as difficult as I thought it would be. 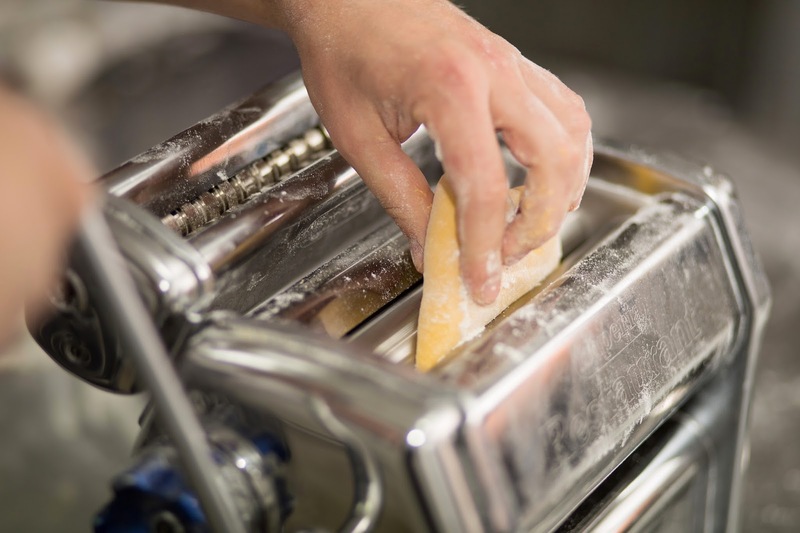 The dough is like any other, and then the pasta machine does the rest of the job for you. So once you learn how to work the machine, inserting the dough correctly into the machine and keeping the handles from falling off and rolling them in the correct direction etc etc you are pretty set. 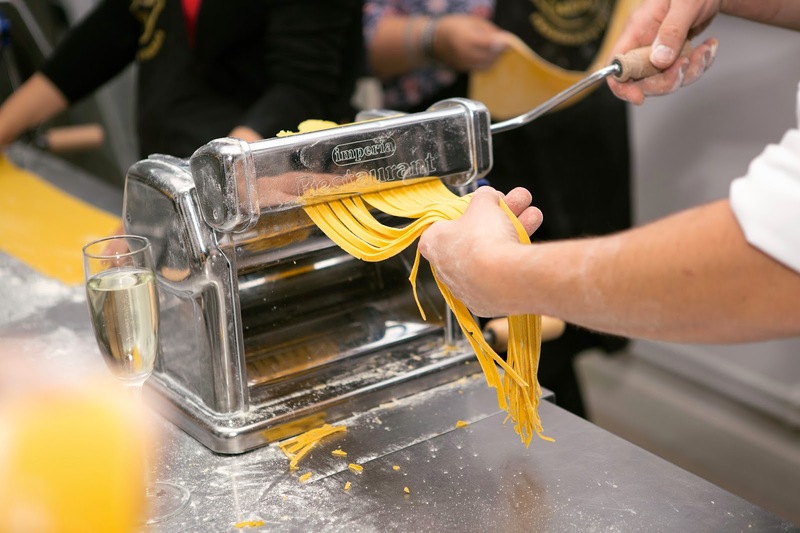 The coolest moment is when you shred the dough, out comes the pasta in nice ribbons. Then you are supposed to carry those ribbons and put them to dry. Looking at all those pastas on the drying rack, made me feel like I have become a proper Italian cook. Next we moved onto desserts. 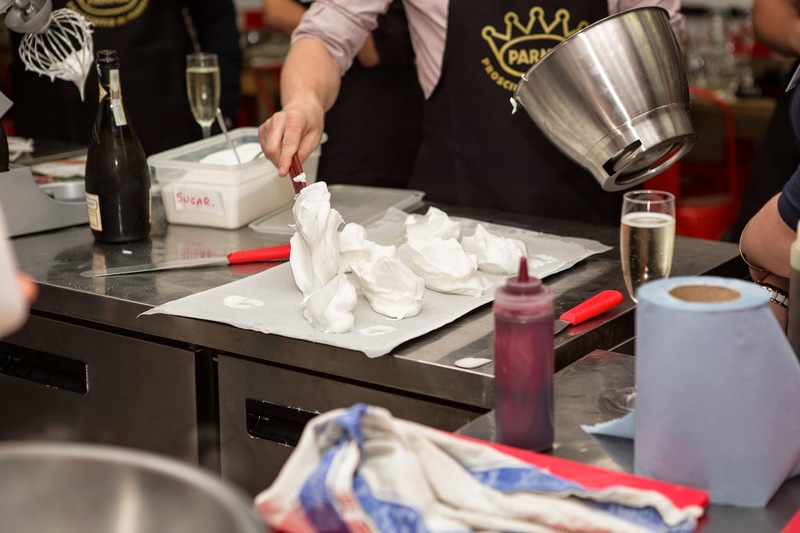 Chef Matrtyn demonstrated to us how to make a soft meringue, to which he added a layer of whipped Chantilly cream, sugar and a raspberry coulis. It went onto become an awesome dessert. 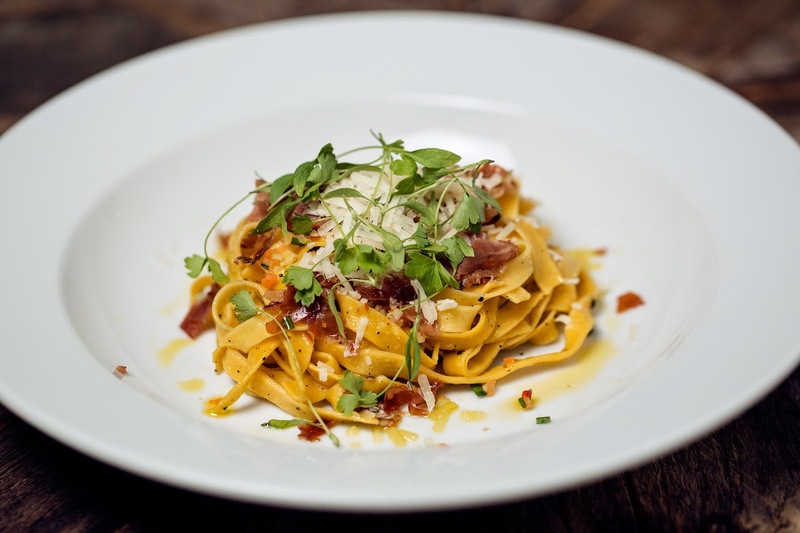 The twist was that it was served with specs of crispy Parma Ham. The ham added a savoury element which helped in cutting through the creamy sweetness and also a texture. Ingenious I say and very interesting! Onto the main course which involved a basic course on butchery. Now I am a pretty squeamish creature, not into butchery in a natural way. But the process was not as bad as I thought it would be. 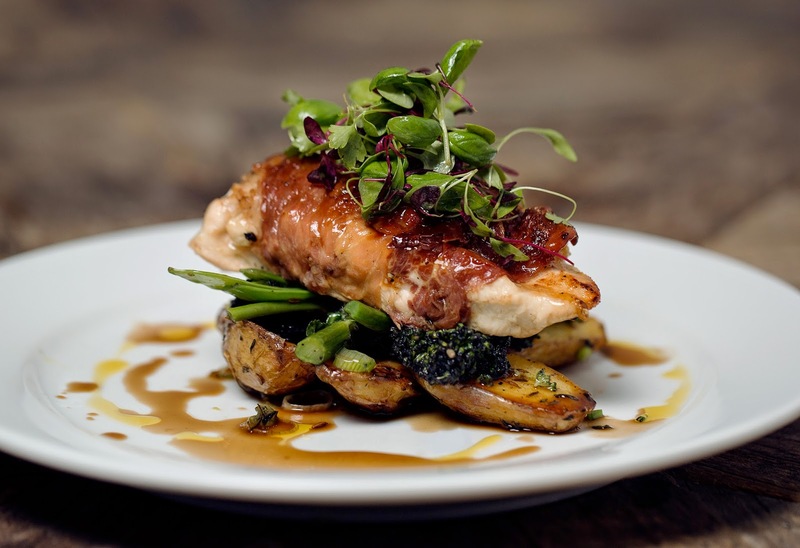 The chefs used the easy bird--chicken, to teach us. We were taught how to separate a leg from a chicken's body and then how to slice out the breast. Next we learnt how to butterfly the chicken breast and what part of the breast is the fillet. Onto the chicken breast we piped in a cream, onion, garlic and herb mixture. Once that was done, we were told to cover the breast, put the fillet on top and then wrap the chicken in Parma Ham slices. These were then sent to the oven to bake. Our classes over, we sat down for dinner. First we were served the pasta which we had made. The pasta was delicious and I almost licked my plate clean. I could get used to freshly made pasta for my supper. The ham had become all crispy and nice while the chicken breast was succulent and juicy and the veggies were oh so good. We tasted some spice in there, on asking was told thast it was cumin and mustard. I have never tasted spices on roasted veggies. Must say they enhanced the taste and took it to the next level. The meringue roulade was very nice indeed. I have never tasted so soft meringue before and the cream filling inside was just right, not too sweet. The candied Parma Ham was the twist in this dessert and added a nice touch. 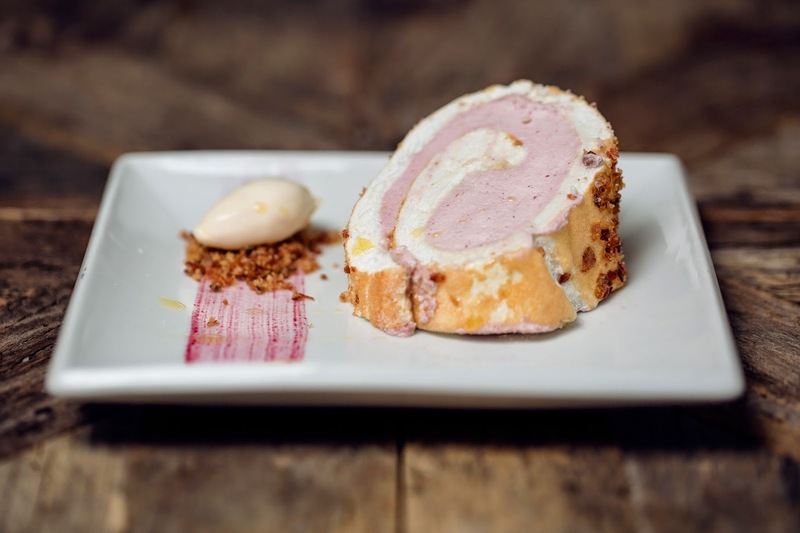 The saltiness of the ham cut through all that sweetness and also added a nice texture to the smooth creaminess of the roulade. 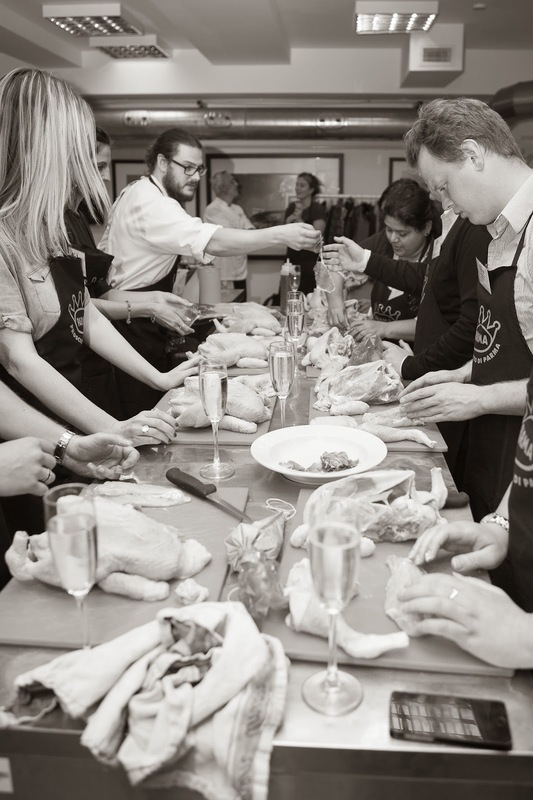 Like I mentioned at the beginning of my post the event was held at the London Underground Cookery School. It was my first time there. Located very conveniently near the Old Street tube station, this school is located in the basement, true to its name. The cooking and demo area is pretty spread out and the team of chefs very efficient. The Parma Ham event was hosted by their general manager Carlos. They hold a series of events there starting from hen parties to corporate events. And like I mentioned the food was very good. Do check the place out.